When I go to the gemba I go with intention. I go to learn about how things really work around here and to understand the problems our caregivers face as they try to do their jobs. In addition to listening, I talk to them about where the organization is going strategically and I coach our managers about how to run a huddle, the use of True North performance metrics and the power of idea systems. Teaching managers about these things reminds me of the old saying “if you give a man a fish you feed him for a day, if you teach him to fish you feed him for a lifetime”. No matter where our managers end up in this organization or another, these basic skills are what will feed them for a lifetime. Listening to your people, showing them respect by implementing their ideas, working as a team and measuring performance is the difference between a lifetime of meaningful work and one frustrating job after another. Healthcare is going through profound changes right now, fewer patients are being admitted to the hospital and more are being treated as outpatients and at home. This is all an intentional strategy by private payers, the state and the federal government to drive care to the lowest cost environment and it is working. From a community perspective, this is a good thing. If you work for a system like ours that must maintain core safety net programs for the community, it is very challenging and at times painful. We have a solid strategy to transition the organization from what it is today to what it needs to be in the future, but the strategy alone will not allow us to be successful, it will take every one of us working every day to improve performance in the organization. It will take managers who have learned to fish for the great ideas that are out there and work with their people to implement them. 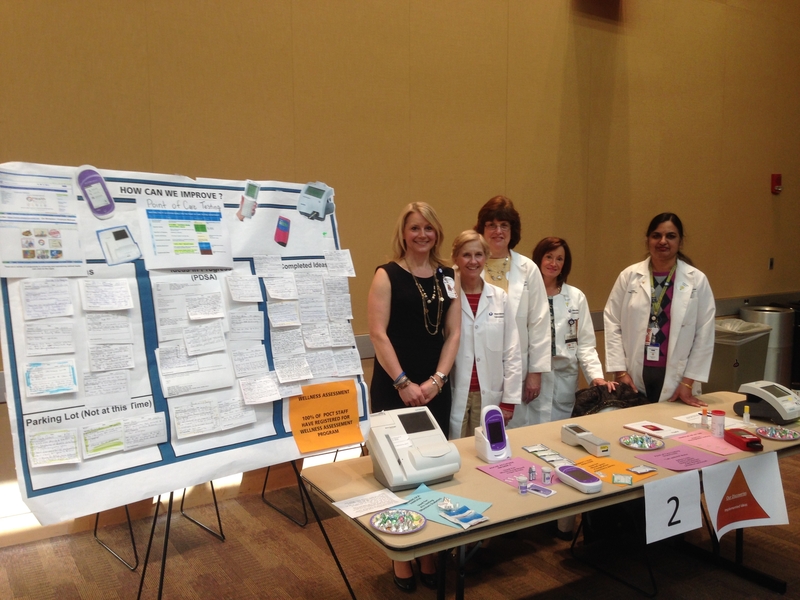 This week’s innovation celebration at the medical center was a showcase of great ideas and the mangers that have learned to listen to our care givers in the gemba and show them the respect they deserve by helping to implement their ideas. Congratulations to all our innovators who attended. Here are a few photos from the event. I am not sure where to post an Idea that would be a system wide idea. My proposal would put an immediate moratorium on providing food at all internal, on-campus meetings. It would not affect meals provided for recruitment or resident training. I do not feel that using system funds to provide food at meetings is a good use of our money at this time. We are all responsible adults who are able to manage our intake of food on our own; if we need to bring food from home or make a quick stop at the cafeteria, we can work that into our day. The savings from this should be used to fund parking vouchers for patients. Many patients are making healthcare decisions based upon their wallets/pocketbooks. Copays are high and many insured have high deductibles; adding a parking expense to the trip could cause a patient to go down the street to St. V’s, who validates parking for patients, or to a community provider for their healthcare. Wouldn’t the majority of us, as healthcare professionals, rather spend UMMHC money giving parking vouchers to patients than getting a complimentary turkey wrap (or coffee and a bagel in the morning) at a meeting? Thank you for your note. With the exception of meetings that have volunteers and guests from outside, this is already supposed to be in place. Do you mind if I post your idea in an upcoming blog post?